What’s a building made of reclaimed wood, corrugated iron and brick that looks like a farm outbuilding doing in the middle of Manchester’s sleek and stylish Spinningfields? This is The Oast House; bringer of beer, food and BBQ meats with a hearty dollop of good times thrown in too. Part of the Living Ventures family, this is their most relaxed and quirky of venues – but looking past the reproduction vintage you can still see the well oiled operational style of Living Venture; well trained staff, detailed concept with great design, decently stocked bar (it’s not just the beer you’d expect) with a good wine and champagne list. To start there’s a choice of a deli counter – lots of different cheeses, meats, dips and fish to build your own board. These come with homemade sides including pickles, piccalilli, chutney and bread – all exceptional quality. Try the two year Lancashire- the best cheese they have a mature, punch in the mouth type of cheese. You can have a salad at The Oast House, but with that big fat BBQ outside, you know it’s about the meat – steaks are charred and are smoky, perfectly cooked, juicy ribeyes. There’s stunning hanging kebabs that are cooked with a sweet chilli sauce and you can even get a whole chicken with crispy, salty skin off the rotisserie. All the mains are served with chips – even if you’re just going to the Oast House for a drink you should have the chips. Many places bang on about ‘properly seasoned,’ but here they most definitely are – salty, herby, crispy, make sure you get more than one portion because you won’t share these. Same goes for the corn on the cob – this is actually the best corn I have ever had. Fact. Charred on the BBQ, slathered with butter, loaded with salt – on my, you truly have to taste them to believe how good they are. 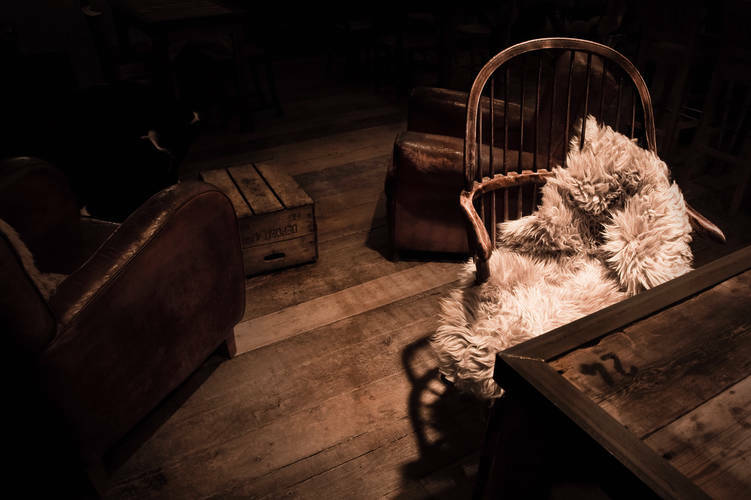 The Oast House offers a great alternative to the stylish, slick bars of Spinningfields; it’s a place you can kick back, relax and have a good time. There’s usually a guy playing jazzy things on the piano, the tables are communal and a sense of fun and frivolity pervades the place. The Oast House: home of fun, good food and a great night out.